Omar's been to the groomer man, and now he's 1/3 the dog he once was. 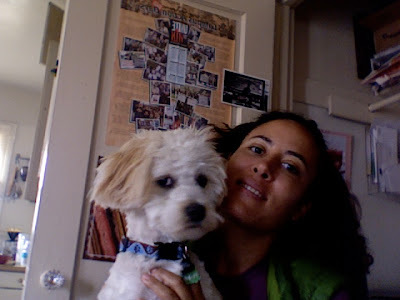 Photo of Omar and me, taken with my mac photo booth. MSM Ladies Discuss Iraq, Gore, Bush, etc. It's kind of loud and hard to take, but highly entertaining. My new favorite food blog. Best quote I read/heard today. Yummy gum flavor I just discovered thanks to JT. I hate and dread going out in my swim suit in public; I'd feel more comfortable in my birthday suit to be honest. I can't help it; even when I'm fit and thin, I'm self conscious of my looks in a swim suit. I've rarely owned flattering suits. I have proportion problems, as I'm a bit top heavy. Blah blah blah, poor me, right. Everyone's got problems, real or perceived. We live in a cruel world in which women are forced to compare themselves to super models. In reality, Elias and I are going to Cancun for 10 days, and no one there knows me. I can look however the hell I want and feel no shame. I need to block it out and be more like Tyra. Coco reef swim wear. Even the 2-piece is flattering with its careful design and fit for the top piece. It's pricey, as you can see from the link (and the page for the tops alone), so check out discount stores. I've seen coco suits at two different Ross stores for $24 for both top and bottom. Today I broke the news to my most Christiany friend that Jerry Fallwell kicked the bucket. She wasn't upset or anything. I'm trying to talk myself out of believing it, but I think she was kind of glad about it. * Could I be imagining it? Later, I checked out a reader feedback page at the LA Times and was shocked that so many people are pleased to see him leave this world. In one of the more charitable comments, the author pointed out that Rev. Fallwell will be surprised, when he gets there, at the folks allowed into heaven. However, most of the posters didn't think Falwell was going to heaven. *I guess if you really love God, Heaven, Jesus, etc., you're happy to see off anyone who gets to join the party/Kingdom of God, right? p.s. -- here's a statement I can get behind: Matt Foreman, executive director of National Gay and Lesbian Task Force, extended condolences to those close to Falwell, but added: "Unfortunately, we will always remember him as a founder and leader of America's anti-gay industry, someone who exacerbated the nation's appalling response to the onslaught of the AIDS epidemic, someone who demonized and vilified us for political gain and someone who used religion to divide rather than unite our nation." I have a lot of moms (biological, step, figurative, and by association a large number due to Elias and the way his family works). I wish them all well. Thanks for everything, and I hope you enjoy your day. I also want to give a big shout out to all the ladies I know who are expecting babies. Good Lord there are a number of you! I'm so thrilled and excited for you all. Spider Man 3 Spoiler Alert -- I'm not going to give away the whole movie, but some people don't want to know anything about a plot or my thoughts before seeing a movie. So, consider yourself warned. I felt that is sucked more than Spider Man 2, and Elias agrees. I liked Venom (the CGI smile and moves) and Bad Boy Peter Parker. Bruce Campbell's performance shined over everyone else's. Otherwise, things like the writing and acting were pretty bad. I especially didn't like all the crying, but at least we were in an "urban" theater with folks who weren't afraid to express themselves about this troubling aspect of the film. Seriously, there was laughter and uproar at the cheesiest parts.